California State University, Fresno will award 98 students the President’s Volunteer Service Award, a national honor offered in recognition of volunteer service, on Monday, May 16. • Molly Fagundes, president of Associated Students Inc. Established in 2003, the President’s Volunteer Service Award is available on an annual basis to individuals and groups who have met or exceeded requirements for volunteer service and have demonstrated exemplary citizenship through volunteering. The American Humanics Program serves as the Fresno State certifying organization of the President’s Volunteer Service Award, allowing the university to nominate potential recipients and distribute the award those who meet or exceed the award criteria. Fresno State has a long history of civic engagement. Students, faculty and staff recognize the importance of being involved in the community to meet the needs of their neighborhoods and the community. The Radin Foundation, through the Community Service Scholarship Program, has played a key role in the building of the community service initiatives on campus. Students involved in 150 hours of service to their community during a semester may apply for a $1,200 scholarship through this program. This year the Community Service Scholarship Program announced a $3,000 “Spirit of Community Scholarship Award” in memory of Marc and Marge Radin to the University Student Volunteer of the Year. 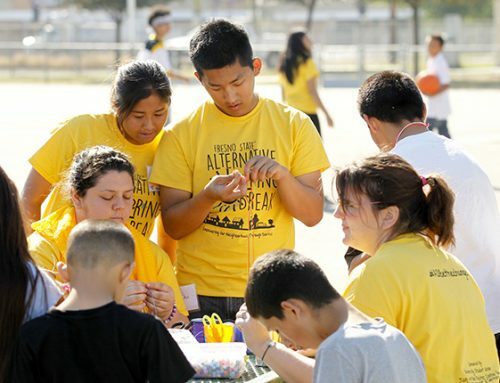 Approximately 4,800 Fresno State students perform over 192,000 hours of service in the community each year. These figures, aggregated across many programs, represent a total economic impact of nearly $3.3 million, not including the significant contributions to the community provided through student clubs and organizations. The award is issued by the President’s Council on Service and Civic Participation, a group created by President Bush to recognize the valuable contributions volunteers are making to our nation. Chaired by two-time Super Bowl Champion Darrell Green, with former U.S. Senators Bob Dole and John Glenn as honorary co-chairs, the council comprises leaders in government, media, entertainment, business, education, nonprofits and volunteer service organizations and community volunteering.